What is Synergy Case Management System? 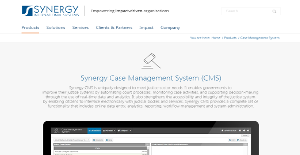 Synergy Case Management System is a reliable and compact case management solution designed to address the needs of justice sector organizations. The software allows governments all over the world to significantly enhance their justice system mainly through the automation of their court processes as well as easy monitoring of case activities. Synergy CMS also provides users with real-time data and analytics, positively impacting their decision making process. With Synergy CMS, citizens are able to reach and interact with judicial bodies and avail the services of said offices via the software’s electronic interface. The software delivers a comprehensive suite of functionality, including online data entry, analytics, reporting, workflow management and system administration. Many justice systems all over the world are outdated and slow, resulting to tons of case backlogs, unprocessed files, and more hearings among others. Ultimately, this is a reflection of the modern justice system that is sluggish and lengthy. Synergy Case Management System (CMS) delivers a robust set of functionalities and features to enable government justice systems to streamline their services, automate critical and time intensive process, and make better decisions based on actual data. Synergy CMS helps take care and ultimately eliminate the numbers of unprocessed cases with its electronic case filing features. This enables users to enter, file, and process new case records and update existing ones with online data entry, taking out the need to file cases in an actual office. This reduces the workload of the court system significantly. To ensure that everything is done correctly. Senior court officials have access to the audit trail and see who filed the case and when it was processed. Synergy CMS boasts of a powerful case workflow management system that streamlines and simplifies many essential processes including filing, processing, approvals, appeals, reproduction, and editing of case documents. The feature also comes with document templates, speeding uup the creation and delivery of documents like subpoenas, warrants, affidavits, orders, and decisions. Scheduling is an essential aspect in any case management setup. Synergy CMS offers an impressive calendar module that helps users organize their schedules and manage their case loads, hearings, as well as meetings with their clients and other court staff. A decision based on data and high quality analytics is imperative. Synergy CMS simplifies the way people and entire offices process their decisions with its case analytics and reporting module. This capability allows users to visualize information via customizable reports, lists, charts, and “Public Views”. The same reports can be exported to various common document formats, including Word, Excel, PDF, etc. If you are interested in Synergy Case Management System it may also be beneficial to investigate other subcategories of Best Law Practice Management Software gathered in our database of SaaS software reviews. Every enterprise is different, and can need a specific Law Practice Management Software solution that will be designed for their business size, type of customers and employees and even particular niche they support. We advise you don't count on locating an ideal software that is going to work for every company regardless of their background is. It may be a good idea to read a few Synergy Case Management System reviews first and even then you should keep in mind what the solution is intended to do for your business and your staff. Do you require a simple and straightforward solution with just elementary functions? Will you actually use the advanced tools required by pros and large enterprises? Are there any particular features that are especially useful for the industry you operate in? If you ask yourself these questions it is going to be much easier to locate a solid service that will fit your budget. How Much Does Synergy Case Management System Cost? Synergy Case Management System is a quote-priced system, meaning that each client receives an individual package tailored to meet his needs. Contact Synergy International Systems for more enterprise pricing details, and ask for your quote. We realize that when you make a decision to buy Law Practice Management Software it’s important not only to see how experts evaluate it in their reviews, but also to find out if the real people and companies that buy it are actually satisfied with the product. That’s why we’ve created our behavior-based Customer Satisfaction Algorithm™ that gathers customer reviews, comments and Synergy Case Management System reviews across a wide range of social media sites. The data is then presented in an easy to digest form showing how many people had positive and negative experience with Synergy Case Management System. With that information at hand you should be equipped to make an informed buying decision that you won’t regret. What are Synergy Case Management System pricing details? What integrations are available for Synergy Case Management System? Synergy International Systems offers open API to allow integrations with third-party systems, and streamline data flow, resolve information silos, minimize redundancy, and enable automated data exchange.